I've reviewed a few Ooba beverages before, and been pretty impressed with them in general. The hibiscus extract seems to blend nicely with the various additional flavorings they use, and the outcome is a well-balanced, not-too-sweet, vaguely tea-ish soda. Thus, when I saw Ooba Hibiscus with Kiwi at Sprouts Market the other day (along with the first Oogave I've seen sold retail! ), I was excited to bring some back to the Lab. When I got back to the Lab, I found that Ooba is good for something else as well. One of my favorite things about being married is the constant discovery of new things about my wife, the Kibbitzer-in-Chief. While her intelligence and insight are well-known to me, the emergence of hidden facets of personality is wondrous and very rewarding. The nice thing about learning this was that it reinforced my dear love's amazing literary geekiness, which is an extremely endearing quality. I've got an icky soda for you. If you are wise, you'll treat it like pee. ...and now it's stuck in your head, too. Ha ha ha! Color: Deep red, very slightly purple. Almost wine-ish. The surface tension of the water causes it to creep very slightly up the sides of the container at the top, causing a curved surface...a "hibiscus meniscus", if you will**. Scent: Wow, not what I expected at all. It's quite sweet and very floral, with little or none of the tartness I associate with kiwi. Nazgul: "It doesn't smell bad, but not good, either. I like it well enough, but it's deeper and darker than I was expecting. Taste: The hibiscus is strong--that nice, mellow sweet-underlaid-with-tart you get from hibiscus. The kiwi part is quite faint; I taste it more as an enhancement of the natural hibiscus tartness than an additional flavor of its own, although I guess I'd need a pure hibiscus version for comparison to be sure. It's nice. A pleasant fruitiness, with some interesting aftertaste...ah. There it is, the aftertaste suddenly shifts to a very tart note, which then (oddly) goes away again. The aftertaste is complex, a blend of tart and ever so slightly bitter, again like tea. This is still one of the more refreshing sodas I know; this would be great on a hot day. Quaff rating: 3.5. Pretty yummy. Cough rating: 0.5. The tartness and slight bitterness are just a bit surprising. * In the book (which is excellent), Creb and Iza are siblings, and Uba is Iza's daughter, which makes Uba Creb's niece. Thus, the relationship between the Creb and Uba in the book doesn't quite match the relationship between the K-i-C's rabbits. On the other hand, Ayla (Iza's adopted Cro-Magnon daughter) does temporarily care for an injured bunny in the book, which she calls her "Uba-bunny". Now you know. ** Yes, I know that a meniscus will appear in any container of watery liquid, at least one in which the material is even a little hydrophilic. It was just an excuse to say "hibiscus meniscus". As was this footnote. *** Alternative ending: "Probably bad with beef stroganoff"
All right, I have a problem. The Weird Soda storage facility at the Lab is approaching full capacity. There's too much Weirdness stuffed into this lab. ...well, all right, there's really always been too much Weirdness in the Lab. What I mean is that the carbonoisolation cryosuspension chamber* is almost full. What's that? You want to know what would happen if it ever reached full capacity? Do you remember that scene in Ghostbusters, when Peck has the gentleman from the utility company shut down the containment field on the ghost suspension facility, and there is a catastrophic explosion in which all manner of otherworldly badness is released, causing havoc all over the city? Kind of like that, except fizzier. Anyway, there's really only one release valve for the pressure buildup in the Lab, and that's to get quaffing. Today, we'll be reviewing something which isn't from a bottler I know. Carousel Black Cherry Gourmet Soda is bottled by Carousel Beverages, in Arlington Heights, IL. Or so says the label. A brief internet search reveals that, as far as I can tell, there *is* no such beverage bottler in Arlington Heights. There is a Carousel Beverages in New York, which seems to supply (but not bottle) beer and soda. A Google search for "Carousel gourmet soda" returns several returns for places where it can be bought, but nothing on the bottler. Perhaps we need a new category for "Orphaned Sodas", cases in which there appears to be no bottling agency extant. This also produces an interesting feeling, knowing that I'm going to quaff something of no parentage, whose origins are unknown and unknowable. It is an isolated soda, adrift in time, without context. Whence came this bottle? From what nighted gulfs did it arise? What dark factory produced this container of dark red, bubbly fluid, sitting on my tabletop in a hideous mockery of normality? What unspeakable secrets might be unearthed if its TRUE origins were ever revealed? What daemoniacal, cyclopean horrors would we witness of its true provenance, its nameless and blasphemous source, were ever revealed? Could this soda be the offspring of the whispered Abhoth, the Fount of Uncleanness, who bubbles and oozes in his lightless caverns and whose existence is only known through half-crazed, suppressed scribblings of the madmen who have returned, broken and maimed, from the curiously carven balcony which overlooks the nethermost pit? Never before has the lack of a website held such eldritch significance. Where found: I think I found this one at BevMo. Color: A deep red, slightly orange-y, very transparent. Scent: Very candy-ish cherry. Similar to the smell of cherry syrup or Grenadine, reminds me of Jujyfruits. Pleasant, but worrisome. Taste: Amazingly, a little less sweet than I would have guessed. The taste is pure black cherry syrup--not the bright red cherry of cherry Popsicles (*sigh*), but rather the slightly darker, more berry-ish black cherry taste of Baskin-Robbins Cherries Jubilee ice cream. That pleasant initial taste fades surprisingly quickly, with the familiar acid aftertaste drifting in. For something which smells as strongly sweet as this, the taste is surprisingly weak. The taste is quite similar to the cherry-flavored jelly candies you can sometimes find around Valentine's Day. Not so bad--the cherry flavor is actually surprisingly pleasant. The aftertaste, though, is oddly similar to slightly burned Doritos. That' not such a good thing, even though it reminds me of nachos. Which are good. Cough rating: 1.0. ...burned cornmeal and then silence. 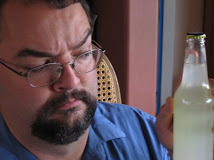 I was doing the usual diligent scouring of weird soda scholarly journals the other day, attempting to keep up with this fast-paced, rapidly evolving research field, when I found myself looking at the Weird Soda Review. You might ask what struck me as odd about that. You might, in fact, suspect that I had inadvertently clicked on a link to my own website, and was even now marveling at the supple, mellifluous prose penned by this demigod of beverage review who called himself "Quaffmaster". You might expect a subsequent post in which I would use words like "mellifluous". I can say with some confidence* that I have never accidentally looked at my own blog and thought it was written by someone else. Weird soda has lots of interesting effects, but that level of intoxication is not usually one of them. In fact, I had stumbled across a column at the LA Weekly entitled "Weird Soda Review", written by Elina Shatkin. It's good stuff. Her writing is witty, and she has excellent taste in Weird soda. Reason the Second: Just to clarify, this blog and that column are unrelated. I don't know Ms. Shatkin, but I wish her all the best, and happily welcome her to the League of Soda Weirdness. * p<0.3. "Some" covers a lot of ground.